I know it’s common to put a lot of time, energy, and work into other people’s projects and let your own personal ones suffer. I feel like that’s what’s happened to my own blog. First of all, I need to write more, period. Second of all, I need to modernize this theme and add some functionality! I spend so much time these days making custom CMS themes and functions and super-awesome screenshot-filled documentation and installing and configuring a ridiculous number of plugins for clients and my regular job, but I don’t seem to bother with my own. I’m still using this ancient theme (which I don’t change because I still like it) and it’s got some old old stuff going on. The comments are especially ugly and don’t have threading enabled. I’m sure it’d be easy enough for me to fix my own stuff, but I guess it’ll have to wait until I don’t feel guilty for not focusing on open projects, including a piano recital next Wednesday. Perhaps I’ll use that Lady René font (yes, the purchase happened) to make a new header so I feel like I’ve done something. But for now, off to do a little late-night practicing that won’t bother my neighbors! 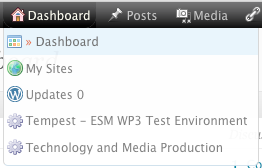 Edit on May 26, 2011: With the release of WP 3.1, the admin bar has links to each of your sites. Way easier, but that doesn’t keep this from working. I just won’t make this into a plugin. Also, subdomains need a different treatment! I’d like to deal with the URL to each Dashboard in a better way. Escaping up two directories is hacky and ugly and wouldn’t work for somebody on a subdomain multisite installation of WP3. It has to do with the way WP wants an internal page within your current wp-admin – the better way would probably be to use a make the callback function redirect to the appropriate Dashboard. This would also allow me to use CSS to define icons for the drop-down version of the admin menu. I could use CSS now, but the ID that is generated is super ugly (i.e. oamsub_http:_______wp-admin – YUCK). Maybe during work hours tomorrow I’ll chew on it a little more.